The same packing density can also be achieved by alternate stackings of the same close-packed planes of spheres, including structures that are aperiodic in the stacking direction. The Kepler conjecture states that this is the highest density that can be achieved by any arrangement of spheres, either regular or irregular. This conjecture was proven by T. C. Hales. Highest density is known only in case of 1, 2, 3, 8 and 24 dimensions. Many crystal structures are based on a close-packing of a single kind of atom, or a close-packing of large ions with smaller ions filling the spaces between them. The cubic and hexagonal arrangements are very close to one another in energy, and it may be difficult to predict which form will be preferred from first principles. The fcc arrangement can be oriented in two different planes, square or triangular. These can be seen in the cuboctahedron with 12 vertices representing the positions of 12 neighboring spheres around one central sphere. The hcp arrangement can be seen in the triangular orientation, but alternates two positions of spheres, in a triangular orthobicupola arrangement. There are two simple regular lattices that achieve this highest average density. They are called face-centered cubic (fcc) (also called cubic close packed) and hexagonal close-packed (hcp), based on their symmetry. Both are based upon sheets of spheres arranged at the vertices of a triangular tiling; they differ in how the sheets are stacked upon one another. The fcc lattice is also known to mathematicians as that generated by the A3 root system. Cannonballs piled on a triangular (front) and rectangular (back) base, both fcc lattices. The problem of close-packing of spheres was first mathematically analyzed by Thomas Harriot around 1587, after a question on piling cannonballs on ships was posed to him by Sir Walter Raleigh on their expedition to America. Cannonballs were usually piled in a rectangular or triangular wooden frame, forming a three-sided or four-sided pyramid. Both arrangements produce a face-centered cubic lattice – with different orientation to the ground. Hexagonal close-packing would result in a six-sided pyramid with a hexagonal base. Snowballs stacked in preparation for a snowball fight. The front pyramid is hexagonal close-packed and rear is face-centered cubic. In both the fcc and hcp arrangements each sphere has twelve neighbors. For every sphere there is one gap surrounded by six spheres (octahedral) and two smaller gaps surrounded by four spheres (tetrahedral). The distances to the centers of these gaps from the centers of the surrounding spheres is √ 3⁄2 for the tetrahedral, and √2 for the octahedral, when the sphere radius is 1. Relative to a reference layer with positioning A, two more positionings B and C are possible. Every sequence of A, B, and C without immediate repetition of the same one is possible and gives an equally dense packing for spheres of a given radius. hcp = ABABABA (every other layer is the same). where d is the diameter of a sphere; this follows from the tetrahedral arrangement of close-packed spheres. The coordination number of hcp and fcc is 12 and their atomic packing factors (APFs) are equal to the number mentioned above, 0.74. Figure 1 – The hcp lattice (left) and the fcc lattice (right). The outline of each respective Bravais lattice is shown in red. The letters indicate which layers are the same. 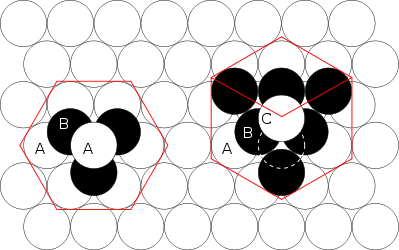 There are two "A" layers in the hcp matrix, where all the spheres are in the same position. All three layers in the fcc stack are different. Note the fcc stacking may be converted to the hcp stacking by translation of the upper-most sphere, as shown by the dashed outline. Figure 2 – Shown here is a stack of eleven spheres of the hcp lattice illustrated in Figure 1. The hcp stack differs from the top 3 tiers of the fcc stack shown in Figure 3 only in the lowest tier; it can be modified to fcc by an appropriate rotation or translation. Figure 3 – Thomas Harriot, circa 1585, first pondered the mathematics of the cannonball arrangement or cannonball stack, which has an fcc lattice. Note how adjacent balls along each edge of the regular tetrahedron enclosing the stack are all in direct contact with one another. This does not occur in an hcp lattice, as shown in Figure 2. When forming any sphere-packing lattice, the first fact to notice is that whenever two spheres touch a straight line may be drawn from the center of one sphere to the center of the other intersecting the point of contact. The distance between the centers along the shortest path namely that straight line will therefore be r1 + r2 where r1 is the radius of the first sphere and r2 is the radius of the second. In close packing all of the spheres share a common radius, r. Therefore two centers would simply have a distance 2r. An animation of close-packing lattice generation. Note: If a third layer (not shown) is directly over the first layer, then the HCP lattice is built. If the third layer is placed over holes in the first layer, then the FCC lattice is created. To form an A-B-A-B-... hexagonal close packing of spheres, the coordinate points of the lattice will be the spheres' centers. Suppose, the goal is to fill a box with spheres according to hcp. The box would be placed on the x-y-z coordinate space. First form a row of spheres. The centers will all lie on a straight line. Their x-coordinate will vary by 2r since the distance between each center of the spheres are touching is 2r. The y-coordinate and z-coordinate will be the same. For simplicity, say that the balls are the first row and that their y- and z-coordinates are simply r, so that their surfaces rest on the zero-planes. Coordinates of the centers of the first row will look like (2r, r, r), (4r, r, r), (6r ,r, r), (8r ,r, r), ... . The first sphere of this row only touches one sphere in the original row, but its location follows suit with the rest of the row. The next row follows this pattern of shifting the x-coordinate by r and the y-coordinate by √3. Add rows until reaching the x and y maximum borders of the box. In an A-B-A-B-... stacking pattern, the odd numbered planes of spheres will have exactly the same coordinates save for a pitch difference in the z-coordinates and the even numbered planes of spheres will share the same x- and y-coordinates. Both types of planes are formed using the pattern mentioned above, but the starting place for the first row's first sphere will be different. The difference to the next plane, the A plane, is again √6r2/3 in the z-direction and a shift in the x and y to match those x- and y-coordinates of the first A plane. where i, j and k are indices starting at 0 for the x-, y- and z-coordinates. Crystallographic features of hcp systems, such as vectors and atomic plane families, can be described using a four-value Miller index notation ( hkil ) in which the third index i denotes a convenient but degenerate component which is equal to −h − k. The h, i and k index directions are separated by 120°, and are thus not orthogonal; the l component is mutually perpendicular to the h, i and k index directions. The fcc and hcp packings are the densest known packings of equal spheres with the highest symmetry (smallest repeat units). Denser sphere packings are known, but they involve unequal sphere packing. A packing density of 1, filling space completely, requires non-spherical shapes, such as honeycombs. Replacing each contact point between two spheres with an edge connecting the centers of the touching spheres produces tetrahedrons and octahedrons of equal edge lengths. The fcc arrangement produces the tetrahedral-octahedral honeycomb. The hcp arrangement produces the gyrated tetrahedral-octahedral honeycomb. If, instead, every sphere is augmented with the points in space that are closer to it than to any other sphere, the duals of these honeycombs are produced: the rhombic dodecahedral honeycomb for fcc, and the trapezo-rhombic dodecahedral honeycomb for hcp. Spherical bubbles in soapy water in a fcc or hcp arrangement, when the water in the gaps between the bubbles drains out, also approach the rhombic dodecahedral honeycomb or trapezo-rhombic dodecahedral honeycomb. However, such fcc of hcp foams of very small liquid content are unstable, as they do not satisfy Plateau's laws. The Kelvin foam and the Weaire–Phelan foam are more stable, having smaller interfacial energy in the limit of a very small liquid content. ↑ Hales, T. C. (1998). "An overview of the Kepler conjecture". arXiv:math/9811071v2 . ↑ "Mathematics: Does the proof stack up?". ↑ Conway, John Horton; Sloane, Neil James Alexander; & Bannai, Eiichi. Sphere packings, lattices, and groups. Springer, 1999, Section 6.3. ↑ David Darling. "Cannonball Problem". The Internet Encyclopedia of Science. 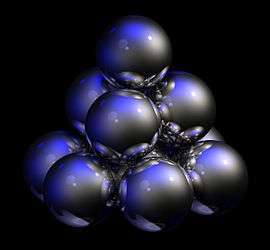 ↑ "on Sphere Packing". Grunch.net. Retrieved 2014-06-12. 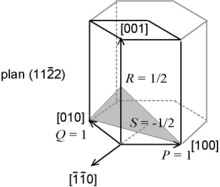 ↑ Weisstein, Eric W. "Hexagonal Close Packing". MathWorld. ↑ Cantat, Isabelle; Cohen-Addad, Sylvie; Elias, Florence; Graner, François; Höhler, Reinhard; Flatman, Ruth; Pitois, Olivier (2013). Foams, Structure and Dynamics. Oxford: Oxford University Press. ISBN 9780199662890. 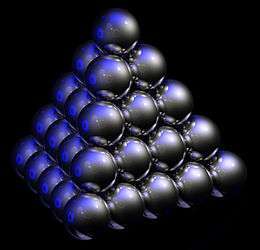 Wikimedia Commons has media related to Highest density sphere packing.